Your product launched a year ago. People raved about how easy it is to learn to use your product. Someone posted a video of a toddler using it, it kicked off a meme, you got a nice bump in downloads, and you were thrilled. Now, people are complaining about how impossible it is to actually get anything done with your product. And your main competitor is making hay with their message of cost-effectiveness and efficiency. Sales have dried up to a trickle. What the heck?! You loosen your collar and walk in to explain to your investors why they will be lucky to get half their investment back – much less the ten-bagger your confidently forecast for them eleven months ago. It sure is good you’re performing this thought experiment before you even build the product, instead of running the gauntlet a year after it launched. There are many reasons a product can fail. 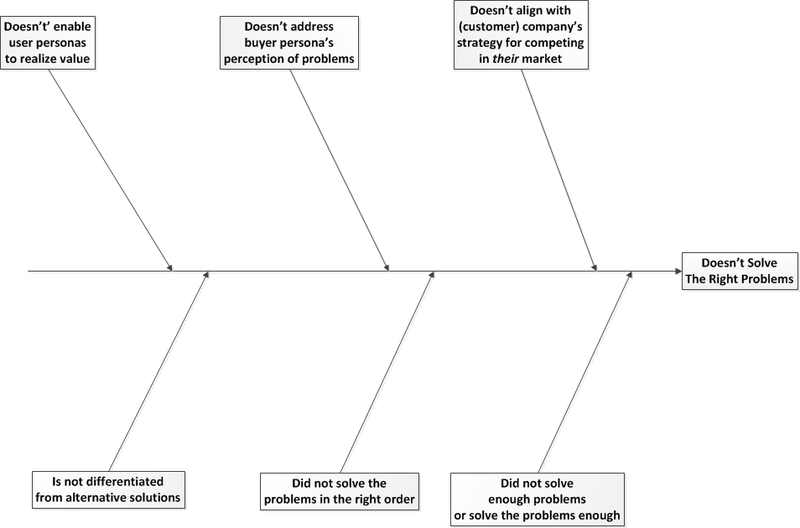 One way to think about your responsibilities as a product manager is to prevent all of them. In this series, we are exploring as many of them as we can. In your exploration of the reasons products fail, you started by making sure you’re solving the right problems. As a firm believer in being user-centric, and making sure you’re delivering value to your users, you’ve doggedly pursued exactly what that means. What you failed to do was understand that your users change over time. I wish Kathy Sierra was still writing online. I first came across her canyon of pain model in 2007. On the other extreme is Apple’s iMovie. It gives you almost no control, but the payoff is high right out of the shrinkwrap. It exceeds my expectations of pain-to-payoff. But pretty quickly, anyone who gets into iMovie–and is bitten by the movie-making bug–starts wanting things that iMovie doesn’t let you control. So… Apple says, “not to worry — we have Final Cut Express HD for just $299″. The problem is, the learning curve jump from iMovie to Final Cut Express is DRASTIC. There needs to be something in the middle, to smooth that transition. Most users are competent users. It makes sense – you start out as a new user, until you develop competence, and possibly develop expertise (although few become experts). How many users will use your product for long enough- and invest themselves enough in learning to use your product to truly develop expertise? Conceptually, you need to build a bridge across that canyon, for your product to meet the needs of your users as they develop confidence (and for the few who become experts). This is an artful dance – designing for the competent users – and your personas are likely to represent competent users, since competent users will be focusing on using your product to solve their problems, not trying to solve their problems with using your product. With your focus on making sure you help your users solve their problems, you may overlook the problem that you introduce – learning how to use your product. So, you better make sure you understand the nature of how people develop competence and expertise. Malcolm Gladwell, in Outliers, builds on Dr. Ericsson’s analysis that it takes 10,000 hours of doing something to become an expert at it (not everyone agrees). Of course people are rarely chained to their desks and using your product continuously. Even call-center employees get 5 to 8 minute breaks every hour. 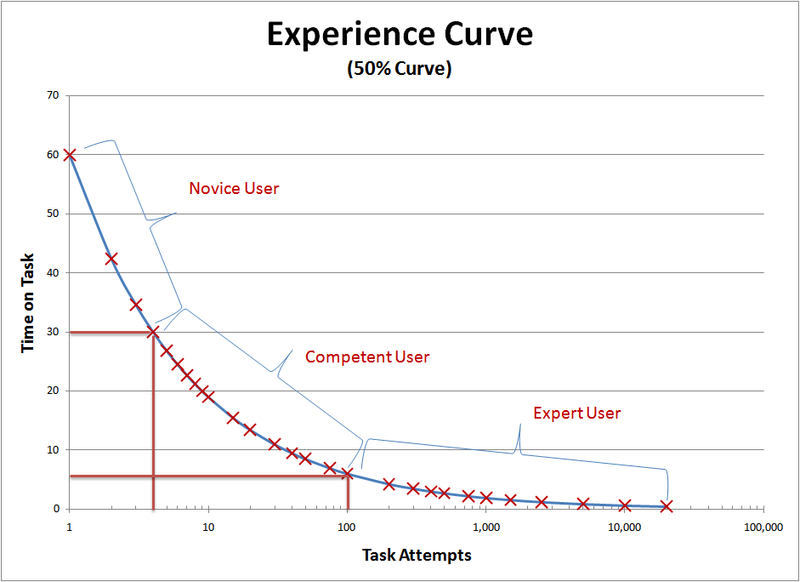 So you should develop some insight into how quickly ( in hours / days / weeks) your users develop competence. Part of the catch-22 of developing products is that by trying to be all things to people in all-levels of competence, you may try and just add features. Over time, this can really add up. 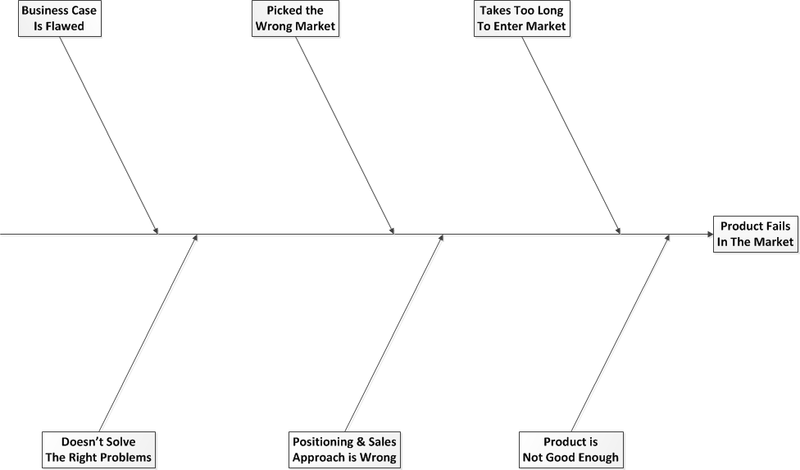 So, you have to figure out the right amount of capability to build into your product. You can play a couple tricks, whipping out your handy Kano analysis skills again, and prioritizing capabilities and features with their characteristics in mind. Failing to take into account the learning journey that your target users go through is just a more nuanced version of the elastic user problem. The easiest way I’ve found – so far – is to treat “learn how to use your product to achieve their (other) goals” as a user goal, and create a distinct persona that represents your target user while they are a novice. By analogy, one persona for the caterpillar, one for the butterfly. If you know of a better way to deal with this as a product manager, please chime in below – this solution is a bit more clunky than I would prefer to use. Your stuff is consistently insightful and useful. This article was especially fun for me to read because it also happens to be on a topic I’m thinking a lot about at the moment (e.g., “how do we keep our tool easy to use while adding new features and helping users (i) learn how to use the new features, and (ii) gain more subject matter expertise (“outside of our tool”) so that they will be able to take full advantage of our tool). I’m sending out this link now to the team as food for thought. Thanks again. Thanks, Justin! I love hearing stories of serendipity when I happen to be writing about something the folks here are thinking about at the moment! No, that’s just old-school Stretch Armstrong. I think he may predate (and maybe his look inspired?) Hulk Hogan. Our product represents an interesting problem. We have as one of our main differentiators that our time to proficiency is lower as we are building upon the well used AutoCAD platform. This means that our base user persona is one who is well used to advanced usage via automation, scripting, and high level mathematics, but at the same time is unaware of basic concepts of our products (such as how our information model ties drawings together into a cohesive whole via a database (sort of). Now it may be a quirk of our product that we get #3 for free when we develop #1 and #2, but nonetheless it’s been a reasonably successful way of thinking about it. Regardless of response, this is a very well written article, and I continually look forward to your posts. Thanks so much, and welcome to Tyner Blain! I really appreciate you sharing your experiences with our readers – and they do mirror my own! The reason I say “clunky” is that creating three different personas to represent the same person (at different stages of learning) in the same role violates (or at least bends) the DRY-rule (don’t repeat yourself). As a person progresses through the learning stages, they will have an evolving set of transient (learning, and possibly task-accomplishment) goals. However, they will have a consistent context, environment, and other identical not-related-to-this-product goals. So it is a bit clunky. What might be more elegant would be a way to incorporate the notion of a user persona that evolves over time. But that introduces different problems, and I suspect the added complexity of adding this dimension would be more work than the repetition. One thing I have done is show how one persona “becomes” another one, for a product where it was not just learning to use the product, but capturing how the user’s environment and perspective evolved over time. A good example is when a knowledge worker is moving from high school to college to the work force. Different social dynamics, expectations, and responsibilities all come into play. 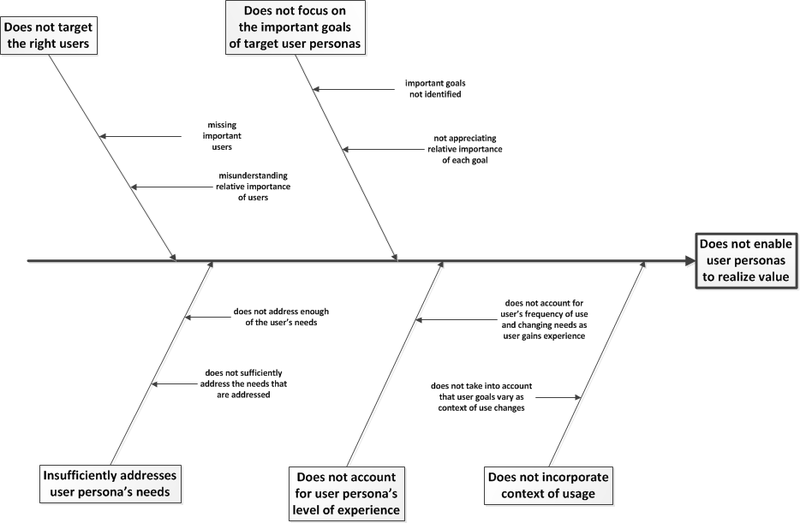 An individual user starts out as mapping to the high schooler persona, but as that user “grows”, she starts mapping better to the college student persona, etc. Ultimately, a weakness of using personas as approximations (the benefit of the focus they provide outweighs the weaknesses of the generalization, imho). 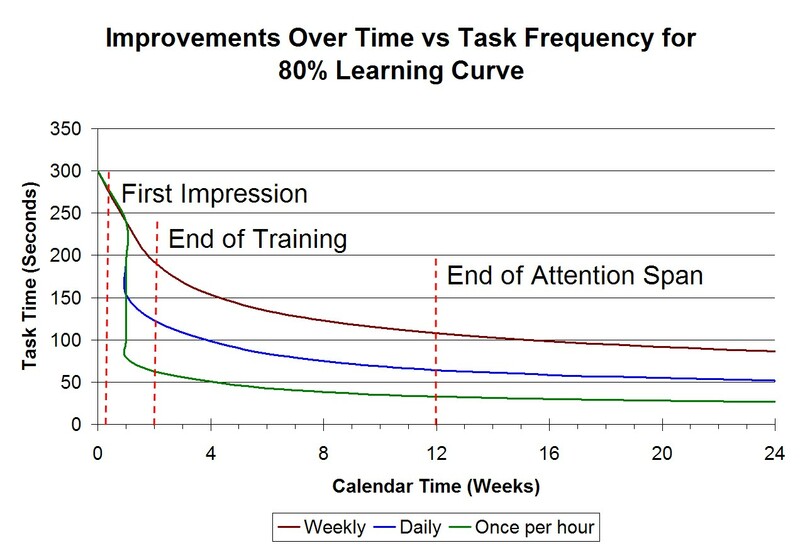 And the notion of learning over time also “pokes” at the model. So, net-net, “clunky,” but better than not doing it, and the best solution I’ve found so far.